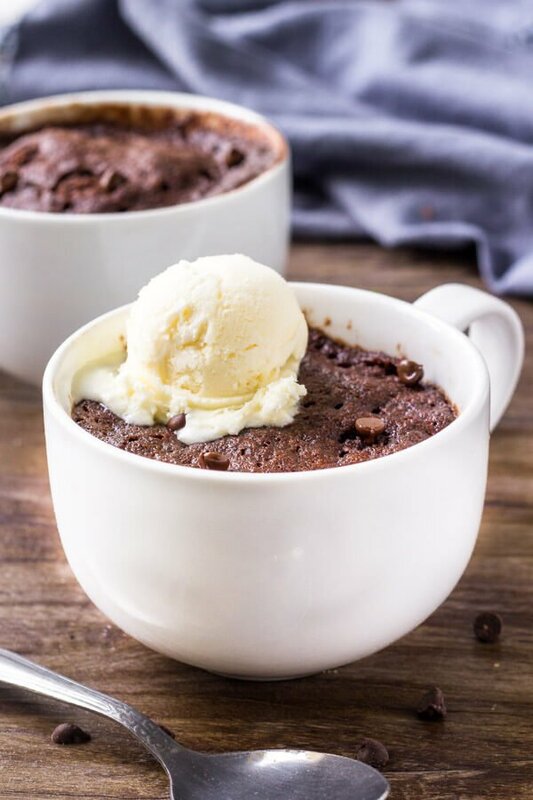 This moist chocolate mug cake fudgy, a little gooey and perfect for when your chocolate craving hits. It’s ready in minutes and the delicious chocolate indulgence. I can’t be the only one who loves a big helping of warm chocolate cake. 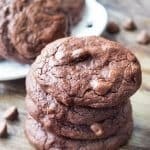 You know the type that’s super fudgy, even a little gooey, and somewhere in between a brownie and a slice of chocolate heaven??? Yeah…. you know exactly what I mean. So today – we’re making the late night, shortcut version. 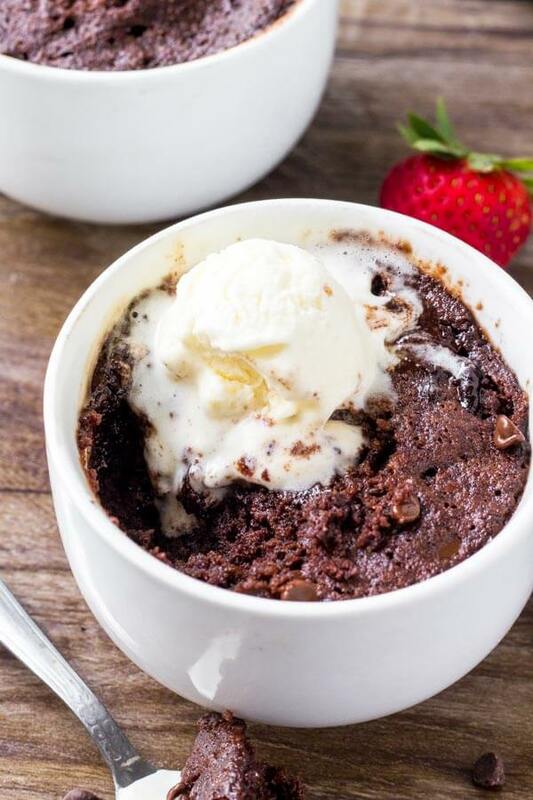 Chocolate mug cake. It’s chocolate-y, it’s moist, it’s fudgy, it’s filled with chocolate chips. And oh yeah, it’s ready in under 5 minutes. So you can literally make it while you’re waiting for Netflix to load. 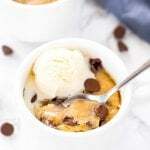 After sharing my vanilla mug cake the other week, I figured it was only fair to my chocolate loving friends to share this chocolate mug cake on the blog. Because how could you say no to a chocolate cake that takes no baking skills and you don’t have to share? If you’ve never made a mug cake before or you’re unfamiliar with the concept – here’s the rundown. A mug cake is a single serving cake where the batter is made inside a mug, and then you place the mug in the microwave to “bake”. Easy, peasy. 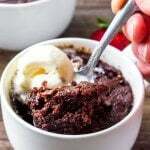 For this chocolate mug cake I wanted it to be fudgy and moist, and I wanted it to use ingredients you already have in your pantry. So – we’re using oil to keep it soft & even a little gooey, 1 egg yolk for tenderness, and moist for moisture. You can use dairy or non-dairy milk, and if you don’t feel comfortable using the egg yolk you can always replace it with milk. Then the chocolate flavor comes from cocoa powder. 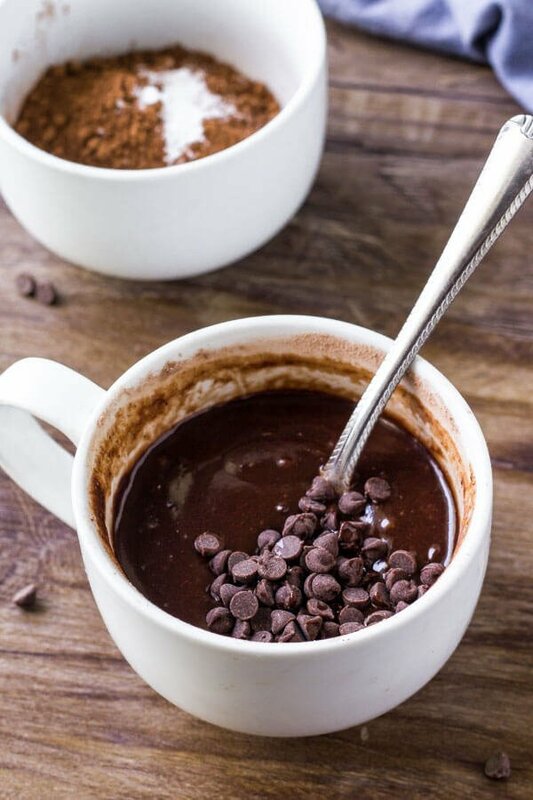 I also added a few chocolate chips for little pockets of melted chocolate goodness – but if you don’t have any on hand your mug cake will still be super delicious. It’ll microwave for about 75 seconds total, and the top should look set when it’s done. It’ll need to cool for about 1 minute before enjoying, then I like to top it off with a little vanilla ice cream. If you have frosting at home – that’s also delicious. Or even a scoop of Nutella or peanut butter definitely does the trick for me. 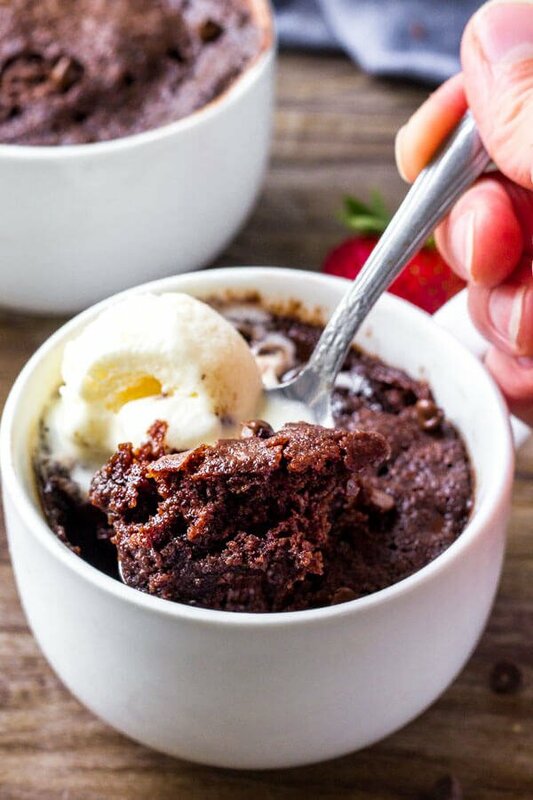 This moist chocolate mug cake fudgy, a little gooey and perfect for when your chocolate craving hits. It's ready in minutes and the delicious chocolate indulgence. In a large mug, whisk together the oil, sugar, egg yolk and milk. Whisk in the flour, cocoa powder and baking powder. Microwave for 75 seconds. The top should look set, but be careful not to overbake or it can get dry. Let cool for 1 minute before enjoying. This would be perfect for those afternoon chocolate cravings. I bet it’s so good topped with ice cream and a bit of peanut butter. I love that combo! Made this with my daughters for a mini girls night and they loved it! The quickest & easiest dessert!! So much goodness in one small cup! Love it! This is such a fun treat to make for a special treat!